A little boy's dying wish came true, thanks to Dame Helen Mirren. Oliver Burton is a 10-year-old boy with Down syndrome who has fought different forms of cancer for nearly his entire life. He was recently diagnosed with terminal spine and bone marrow cancer. 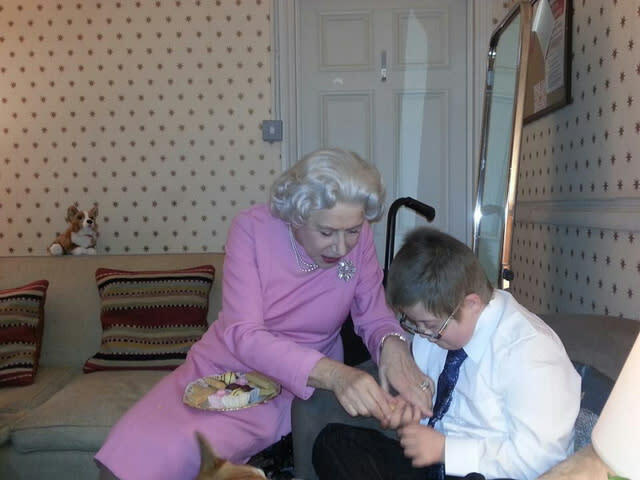 Oliver requested to visit Buckingham Palace and have afternoon tea with the queen of England as his dying wish. A national trust that helps cancer-stricken children says Queen Elizabeth was unable to accommodate the little boy. That's when Mirren stepped in to take her place. Mirren, who won an Academy Award for her portrayal of Queen Elizabeth II in the 2006 film "The Queen," effortlessly took on the character for Oliver's sake. First, Mirren invited the boy and his parents to see her performance of the queen in a play she's currently in called "The Audience." Following the play, the family was invited backstage to have tea and cakes, served by footmen, and meet Mirren and her corgis. Mirren remained in character during the entire encounter; she even knighted Oliver and gave him the official title of "Sir." Oliver's father, James, said that his son thought Mirren was indeed the real queen. The National/Regional Children's Tumor Leukemia and Cancer Trust posted their joy about Oliver's experience on their Facebook page, and wrote, "Our incredibly brave Ollie has Tea with The Queen!" Mirren told the Sun, "It was a pleasure and privilege to meet such a brave young man."